You can make your hair healthy without visiting a beauty salon and spending much money there. People irrespective of their casts have a great natural passion for beautiful hair as it adds beauty on their overall beauty. Moreover, a great volume of healthy hair makes you look younger. But getting a healthy hair is not at all a problem. Take a little initiative to take care of your hair. You will get various hair care products at home which will help you to get a healthy hair. Apart from that follow a healthy diet to make hair internally strong and keep aside those chemicals such as hair dye, lacquer, hair perfumes, shampoos, etc. to save your hair from unnecessary damage done by them. There are various effective home remedies to make your hair healthy. This article will give you a few tips on home remedies for healthy hair. Yogurt is an excellent produce to keep your hair healthy. Egg also contains vitamin B complex which is essential to make your hair healthy. Break one egg and beat it properly. Add 2 -3 tablespoons of plain yogurt in it.Mix well and apply this pack on your hair. Let it dry and then wash with plenty of plain water. Weekly egg and yogurt treatment is necessary to make your hair healthy. Mix a tablespoon fenugreek powder with a cup of coconut oil. Stir well to mix it properly. Now massage that oil on your scalp and hair in a roundabout way.Leave it for an hour or two. Regular massage of this oil helps to cure dandruff and other infection from your scalp and makes your scalp healthy. Take a cup of olive oil and squeeze one lemon in it. Mix well and massage that on your scalp every day. Leave it for sometimes and then wash your hair.Olive oil and lemon juice supply vitamin E and vitamin C respectively which are necessary for a healthy hair. Crush one fresh amla or Indian gooseberry and extract the juice. 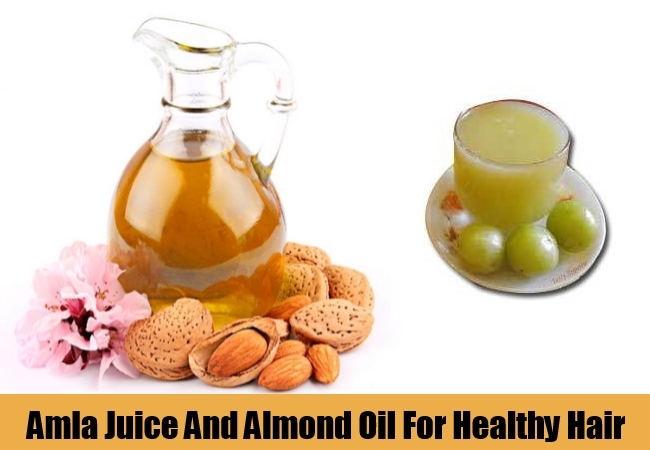 Mix a teaspoon amla juice with every 1 tablespoon of almond oil.Mix well and massage that on your scalp at night before going to sleep at night so that your scalp gets adequate time to absorb the oil and the juice. Cook 10-12 fresh curry leaves and a teaspoon mustard seeds in a cup of coconut oil for five minutes. Strain the oil and massage it every day on your scalp.Massaging will enhance the blood circulation of your scalp and curry leaves not only rejuvenates your hair, it also boost up the new hair growth. Thus it makes your hair healthy. In a grinder add a banana and a tablespoon of mustard oil. Grind it to make a paste. Apply that banana mustard oil pack on your hair at least once in a week. Regular application of this pack makes your hair healthy due to presence of high potassium in banana. Follow these tips according to the instruction. Moreover you need to have a healthy diet comprising fresh fruits and vegetables for the supply of minerals and vegetables. Eat lean protein everyday in limited quantity for the supply of protein. All these things are necessary for a healthy hair.